Register no later than January 31st! Includes cardio membership, Fitness & Food Log, chance to win great prizes! 4 week challenge…turn in fitness log weekly for prizes! and complete the weekly challenges listed below! Turn in Food Log weekly for prizes! I’ve been a big advocate of protein over the years and have written plenty of articles about the benefits of protein and how to get more protein into your diet. There’s always more to learn though, so I wanted to share what I recently read in this month’s IDEA Fitness Journal called “Tapping the Power of Protein” by Christopher R. Mohr, PhD, RD. This article emphasizes eating high quality protein at least three times per day. Be sure to eat protein throughout the day, but particularly at breakfast. Americans tend to eat most of their protein later in the day, however we should really be eating in for breakfast. According to Stewart Phillips, PhD and professor at McMaster University, “It’s a good idea to aim for around 20 g of protein if you’re younger or 30-40 g if you’re older.” Also, in a 12-week study conducted by Heather Leidy, PhD, an assistant professor at the University of Missouri it was discovered that a high protein breakfast (35 g of protein) reduced daily hunger and led to voluntary reductions of about 400 calories in daily food intake. I learned about an amino acid called leucine. When this amino acid is present muscle protein synthesis will occur. So which foods that are high in leucine? IDEA fitness journal’s article mentions the following: cottage cheese, chicken breast, ground beef, wild salmon, whole egg. I searched online for more options because I felt that list was very limited for vegetarians. Here are some good choices: soybeans, pumpkin seeds, peanuts, and white beans. The goal is to eat 2.2-3 g of protein with each meal. This is great time of year to buy fresh produce…But the burning question is: When to buy organic? A nonprofit organization call the Environmental Working Group looked at 51,000 pesticide tests for 53 popular fruits and vegetables and then ranked them based on how much and how many different pesticides were found. The Dirty Dozen is their list of the 12 foods shown to have the highest levels. I see flip flops everywhere I go during the summer, but honestly, I can’t stand them! I don’t like the feeling of the thong between my toes. I don’t like the way my arches cave inward because they have zero arch support. I can’t walk normally in them because I have to grip with my toes in order to keep them on my feet. All of this got me wondering: Is it just me or are flip flops actually bad for your feet? I did some research…Turns our my gut feeling about flip flops was right: Flip flops are bad for you! In 2008, Auburn University conducted a study led by biomechanics doctoral student Justin Shoyer. The researchers speculated that the altered gait could result in pain from the foot up into the hips and lower back. Here’s to your happy, healthy feet! Are you “good” all week, but sabotage your weight-loss efforts on the weekend? Avoid weekend weight gain with the tips below! Researchers at the Washington University School of Medicine in St. Louis studied how weekend behaviors affect weight loss. The study involved 48 healthy adults aged 50 to 60 years. Prior to starting these programs all participants were found to consistently gain weight on weekends, but not weekdays! In fact, the average weekend weight gain would have led to an extra nine pounds over the course of one year. Group 1 (diet group) took in 20% fewer calories each day but didn’t change their activity level. Group 2 (exercise group) increased their daily exercise regimen but didn’t change their diet, to have a comparable energy deficit as Group 1. Group 3 (control group) did not change their diet or activity level. What happened? During the year-long program both Group 1 and Group 2 did well during the week, however on weekends the diet group stopped losing weight and the exercise group gained weight due to higher calorie intake. According to Susan B. Racette, PhD, assistant professor of physical therapy and medicine at the Washington University School of Medicine in St. Louis, “We thought weekends would present a problem for some people attempting to lose weight, but the consistency of our finding before and during the interventions was surprising. Subjects in the diet group lost weight during the week, but over the weekend, they stopped losing weight because they were eating more. Eat before you go grocery shopping Many people do their week’s grocery shopping on Saturday or Sunday, do not go to the store hungry or you will most certainly put things in your cart on impulse. Keep healthy snacks on handy in the car Whether you are traveling or running errands, carrying a healthy snack will keep you out of the drive-thru lane. Keep a food journal A journal will make you more mindful of what you are putting into your mouth. A recent study found that food journaling actually doubled weight-loss efforts! Limit eating out Try to avoid fast food all together. If you do eat out remember to eat reasonable portions and eat all your vegetables. Limit your alcohol consumption There are a lot of empty calories in alcohol. It also reduces your inhibitions to eat junk food AND makes you feel hungrier. Plan to get some exercise Schedule in exercise either one or both days. If you are away from home and no equipment is available simply put on your walking shoes and get moving! Which tactics above did you try? Did they work? Ask yourself: What can you do better next weekend? Dina has been training at XO Fitness since 2012. Ashley joined her starting last summer. Whose idea was it to start working out together? Why? Dina: It was my idea to start working out together. I wanted to do something active with Ashley rather than just sitting on the couch together. I wanted to show her that you don’t have to be an athlete to be in shape, you just have to be willing to put a little effort forth. I’d be willing to bet that if she saw what we were able to do at our first session versus our current session she would be shocked at what she’s accomplished. 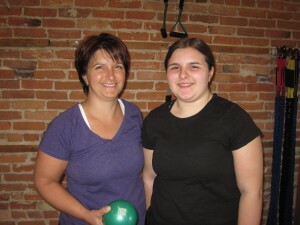 Because of my past experience with Lori at XO I knew that you would be able to help us with strength and toning that we wouldn’t otherwise accomplish on our own. What do you like best about working out with your mom/daughter? Dina: The one hour of working out at XO with Ashley seems to go by much faster than trying to do a workout on my own at home. I like that we both secretly try to compete against each other, even though neither one of us would admit it. It’s what’s helped us push forward thru tough workouts. We also get a good laugh at each other afterwards. Ashley: It makes it more interesting and it gives me quality time with my mom. We wanted to share some of the best stretches for cyclists with you because it is officially Bike to Work Week! Be sure that when you finish your ride you take the time to work on your flexibility. Stretch your hip flexors, quadriceps, low back, and chest so that your overall posture won’t be affected. Hold all stretches for at least 5 seconds (on the video the stretches aren’t held for the entire length of time just to keep it short and to the point). Check out our video to see what you can do to get those muscles stretched out after your workout! If you are interested in more stretches that you can do after cycling contact us at info@xofitness.comHope to see you out and about! Happy riding! This week we are featuring another Mother Daughter Fitness team! Anne has been training with us since 2008! Grace joined her beginning in 2010. Anne: It was my idea. I was working out at XO and really enjoyed the benefits of working out. So I talked Grace into joining me. Grace: It was mom’s idea to start working out together and I thought it was a good idea so we started working out. We both wanted to get more in shape and she thought it would be a great idea to do it together. Anne: The time we spend together. Also seeing how each of us are improving in our strength, balance and coordination. 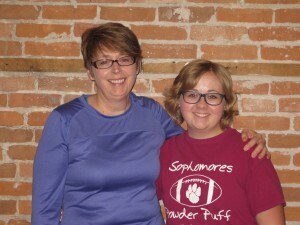 Grace: Working out with my mom is a fun way that we can connect with one another. It gives us quality time together as well. Throughout the past four years, both of our lives have become more chaotic so having an hour two days a week to spend time with one another is awesome. As a Mother’s Day gift, which exercise would you like to elect you daughter to do for you?